One year ago today, an airplane carrying the players, coaches, and training staff of KHL team Lokomotiv Yaroslavl crashed immediately after a failed takeoff. Of the 45 people on board, including the pilots and flight staff, 43 were dead on site. One surviving player, Alexander Galimov, died in hospital shortly afterward, leaving crew member Alexander Sizov as the lone survivor from the crash. There are rare moments when human tragedy or triumph seemingly trumps, temporarily at least, the many problematic aspects of sport. The KHL is a highly political league given its ties to the Vladimir Putin (he has referred to the KHL as “an instrument of Russian foreign policy“) regime and the heavily influence of the Russian oligarchs who made their fortunes preying on the ruins of state run Soviet industry (for example, oil companies Gazprom and Rosneft own KHL teams SKA St. Petersburg and CSKA Moscow, respectively). The league is certainly fraught with problems, as, of course, is its North American counterpart the NHL. However, the Lokomotiv tragedy temporarily pushed those concerns aside and united hockey fans across the globe, many of whom had never previously heard of the team, in awe and sorrow. Many fans in North America found personal connection to the tragedy through the players who had played for their favourite NHL teams before plying their trade in Russia. Names like Brad McCrimmon, Igor Korolev, Pavol Demitra, Ruslan Salei, and Alexander Karpotsev were immediately familiar to countless NHL fans and gave a known human face to the shocking tragedy. Coming at the end of a summer in which NHLers Rick Rypien, Wade Belak and Derek Boogaard all passed away through suicide or accidental overdose, the Lokomotiv crash carried particular gravitas as the bookend to a summer that shook many fans and members of the hockey community. While a patchwork Lokomotiv team uniting to compete in the the 2011-12 KHL season would have certainly held emotional appeal for many fans, the club’s decision seems like the most sensitive way to deal with the tragedy. Now, one year after the tragedy, Lokomotiv is back in the KHL for the 2012-13 season. 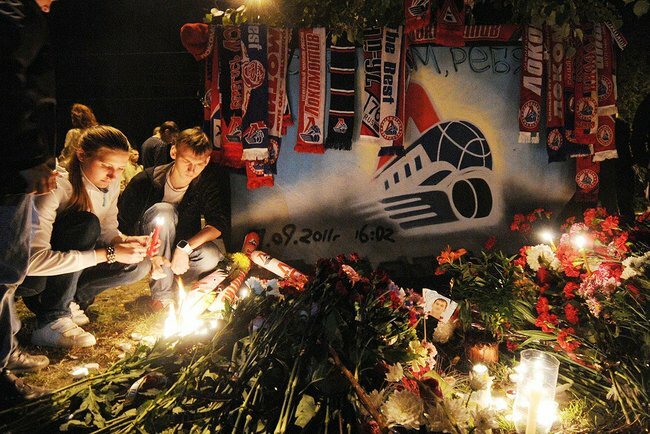 The Lokomotiv plane crash is one of the rare sport moments that transcend fan affiliation across teams and even sports. In soccer, the 1958 Munich air disaster that claimed the lives of many Manchester United players and officials is still commemorated by English clubs and fans, even by bitter rivals. Meanwhile, Liverpool FC annually commemorates the death of 96 supporters who died in the Hillsborough disaster of 1989 and does not play matches on the anniversary of the event; many other clubs and their fans commemorate the tragedy. Such moments in sport are rare, but when they occur they are profound. Tragedies offer moments for individual and collective reflection and contemplation. But of course, they can quickly become politicized and deployed in support of particular ideological agendas. I do not know enough about the politics of the KHL to know if, and if so how, the Lokomotiv tragedy may have been taken advantage of in pursuit of particular political ends. There are also many lingering questions stemming from the air crash that require critical investigation. Why, one year ago, did the Lokomotiv team step into a plane flown by unqualified pilots? Why did it take this tragedy for the KHL to negotiate the issue of safe travel arrangements with its player’s union? As mentioned earlier, there are many problematic aspects to the KHL – above and beyond those raised by the Lokomotiv crash – however, on this day, it is the 44 people who lost their lives that hockey fans around the world are remembering. And, whether or not it has any lasting impact, the tragedy at least temporarily united hockey fans in solidarity and sorrow for the loss. One year later, it is worth remembering this. RIP victims of the Lokomotiv Yaroslavl disaster.